For only the third quarter in the past five years, TIPS returns were negative. The average loss in the 2013 fourth quarter was 1.9%, according to our calculations. 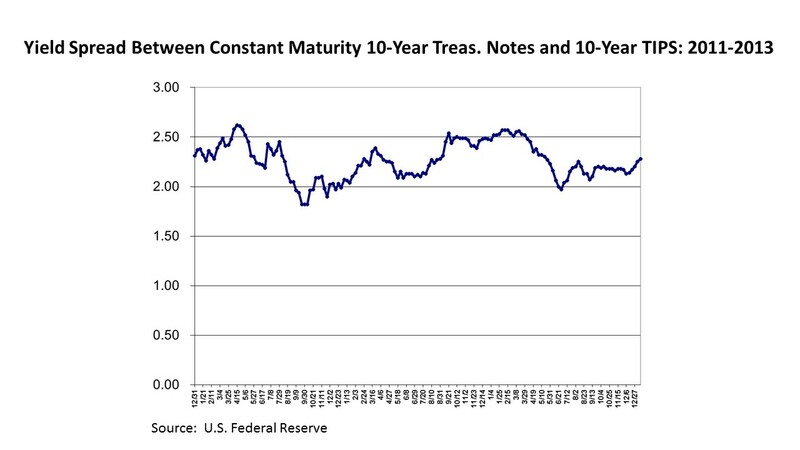 By comparison, comparable maturity straight Treasurys lost 1.2%. 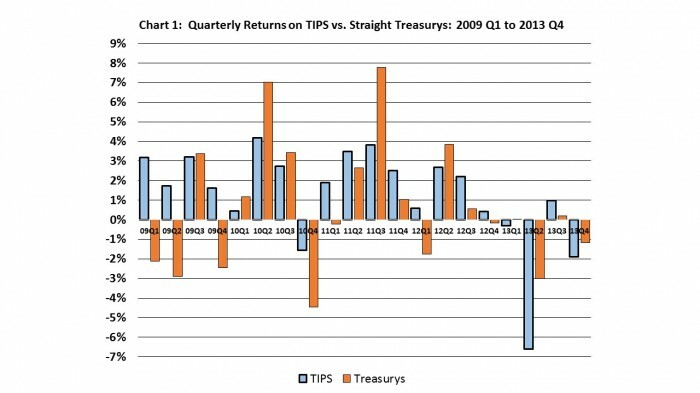 This was the third quarterly loss this year for TIPS and also the third time that TIPS underperformed straight Treasurys. For the full year, TIPS posted a loss of 7.7%, nearly twice the 3.9% loss on straight Treasurys. From 2009 (when we began tracking TIPS) to 2013, the only other recorded quarterly loss for TIPS was in the 2010 fourth quarter. Then, both TIPS and Treasurys gave back some of the “flight to safety” gains that they had booked during the summer sell-off that year. Over the four years prior to 2013, TIPS had consistently outperformed straight Treasurys, due to high investor demand. Since inflation expectations remain dormant, it is not surprising that TIPS would give back proportionately more of their gains as interest rates begin to normalize. In the 2013 fourth quarter, longer maturity TIPS suffered the greatest losses, with a decline of 4.8%. By comparison, intermediate TIPS lost 1.5 and short-term TIPS eked out of small gain of 0.1%. Long-term straight Treasurys also lost more than intermediate and short-term Treasurys, but less than TIPS. TIPS ended the year with an average yield of 0.04%, compared with -0.10% at the end of the 2013 third quarter and -0.92 at the end of 2012. This was the first time since the 2011 second quarter that TIPS ended a quarter with a positive average yield. 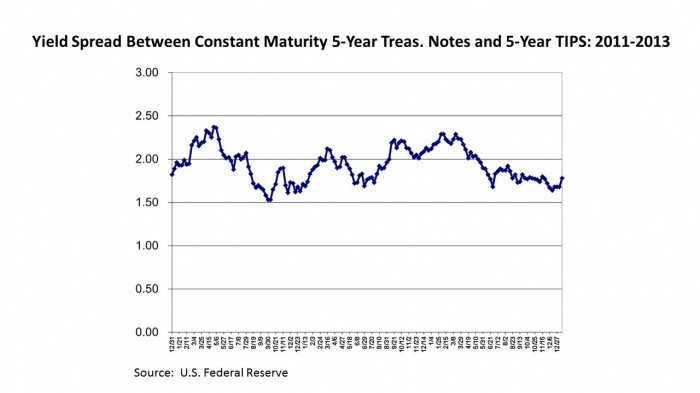 Yields on comparable maturity Treasurys ended 2013 at 1.86%, compared with 1.65% at the end of the 2013 third quarter and 1.13% at the end of 2012. This was the highest average yield level for Treasurys since the 2011 second quarter. TIPS underperformed straight Treasurys in three of the four quarters of 2013. This follows a five-year period where they had generally outperformed straight Treasurys, as investors rushed for protection against inflation. Returns on straight Treasurys have sometimes been more volatile than TIPS, especially during periods of economic and financial market turmoil, when they have been viewed as a safe haven (and inflation expectations have declined). 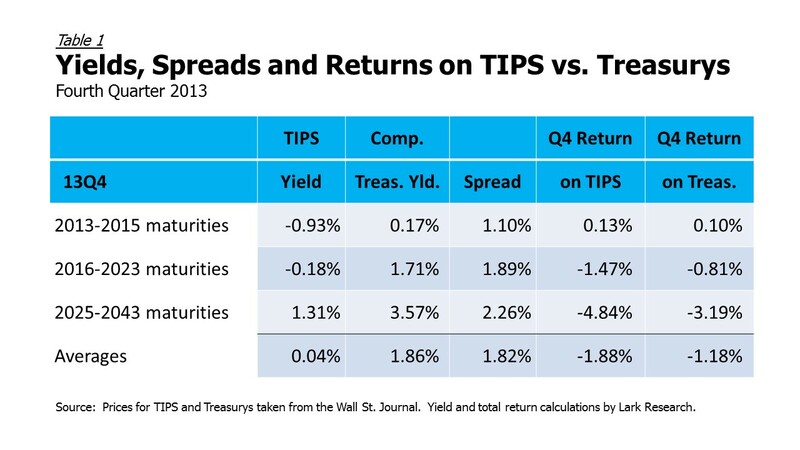 For all of 2013, TIPS underperformed comparable maturity Treasurys. On average, according to our calculations, TIPS posted a loss of 7.74%. Treasurys, on the other hand, lost 3.97%. 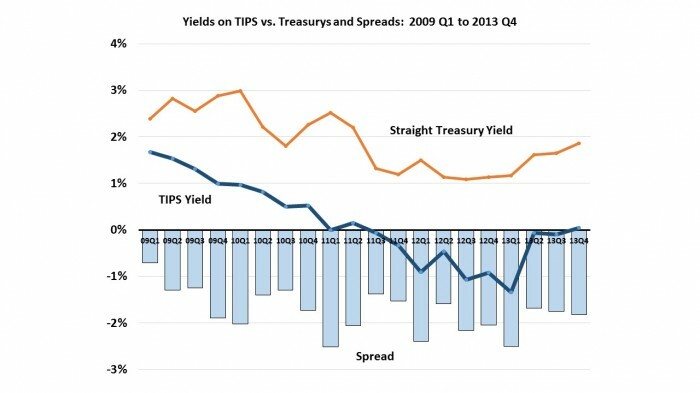 With average yields on TIPS increasing faster than Treasurys, the average spread declined from 205 basis points to 194 basis points. The average yield (for the full year) increased 47 basis points to -0.37% for TIPS, while the average yield on comparable maturity Treasurys increased by 36 basis points to 1.57%. 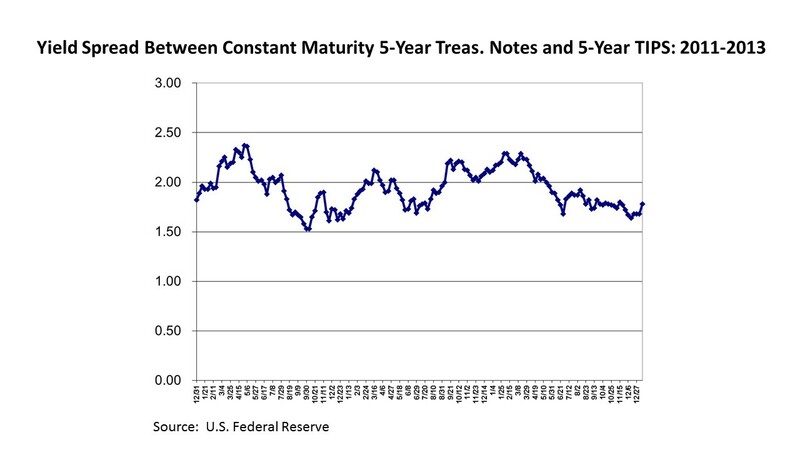 Chart 2 shows the average yield trend in TIPS and comparable maturity Treasurys as well as the average spread between the two. TIPS yields declined steadily from 2009 until the first quarter of 2013, but they rebounded sharply when Treasury yields began to rise in May 2013. This marked the beginning of the return to normal interest rate levels. At this point, yields on TIPS are still near zero and well below their longer-term averages. Straight Treasury yields also remain low by historical standards. Assuming that interest rates begin to normalize, yields on both should continue to rise in 2014 and beyond. With the recent snap-back in interest rates and the relative underperformance of TIPS, the spread between straight Treasurys and TIPS has returned to 5-year average levels. 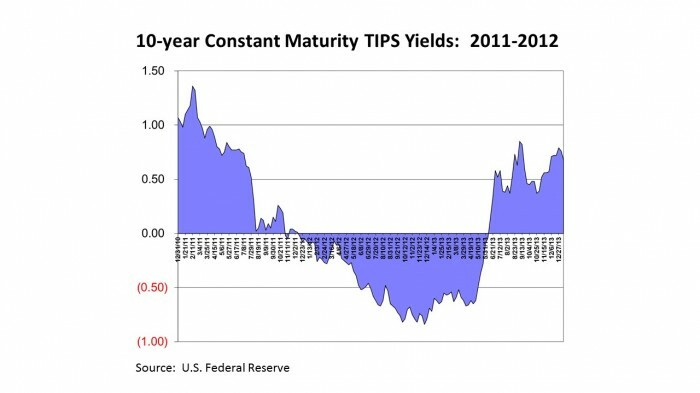 This suggests that TIPS do not look especially rich or cheap to straight Treasurys. Going forward, inflation expectations will likely drive the relative performance of TIPS vs. Treasurys. If the economy continues to recover and interest rates rise, TIPS could outperform Treasurys, especially if inflation expectations rise. In that case, the spread between TIPS and Treasurys would increase. Still, there are no clear signs at this time of an imminent pick-up in inflation (or inflation expectations). Indeed, the IMF sounded an alarm on global deflation in January 2014. We would assign a low probability to the prospects for any long period of deflation; but it cannot be ruled out completely. 5-Year TIPS yields rebounded sharply from around -1.50% in April 2013 to about +0.04% (four basis points) at the end of 2013. 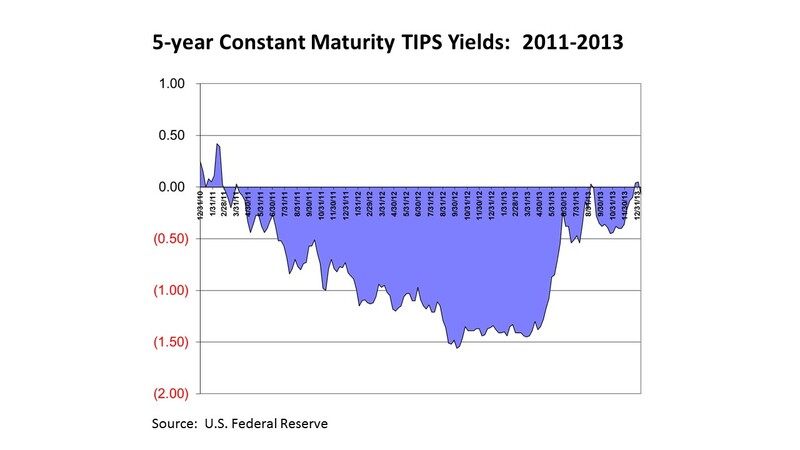 Similarly, the 10-year TIPS yield rebounded from -0.65% in April to +0.77% at the end of 2013. In the second quarter, TIPS suffered an average loss of 6.6%, with the losses concentrated in the intermediate and long maturities. Straight Treasurys fell 3.0% on average, with losses also in the intermediate and long maturities. The losses were sparked by comments from the Fed Chairman regarding the potential beginning of the tapering of QE. Breakeven spreads declined from 250 basis points on average in the first quarter to 168 basis points, as the losses on TIPS exceeded the losses on straight Treasurys. The decline in breakeven spreads was greatest in the shorter maturities, due primarily to a decline in inflation expectations. In the 2013 third quarter, TIPS produced an average gain of 1.0%. Principal losses were slight in both the short and long maturities, but positive inflation adjustments mostly offset those losses. In the intermediate maturities, rising prices and a positive inflation adjustment produced modest gains. Short-term TIPS broke even for the quarter, but intermediate-term TIPS earned a total return of 1.5% and longer-term TIPS 0.9%. Straight Treasurys earned a total return of 0.2%, with losses in the long maturities. Breakeven spreads increased slightly from 168 basis points in the second quarter to 175 basis points, due to the increased yield on straight Treasury securities. For additional commentary on TIPS performance as well as ongoing analysis of stock, bond and mutual fund investments, subscribe to Income Builder, a newsletter published by Lark Research. You can view sample reports and take advantage of a special introductory subscription offer at www.larkresearch.com/income_builder. May 7, 2014 (using material originally published on October 24, 2013 and January 18, 2014). © 2013 Lark Research, Inc. All Rights Reserved. Information is carefully compiled but not guaranteed to be free from error. Specific reference to any specific security should never be construed as a solicitation to either buy or sell. Reproduction without permission from the publisher is prohibited.